As you are aware, Oracle DBA is an evergreen technology in the market. As the usage of Oracle DBA is increasing day by day, the demand for experts is ever increasing. 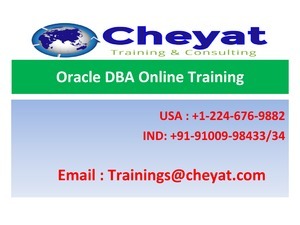 Cheyat offers the best up-to-date Oracle DBA online training through its seasoned trainers. Jump ahead in your career by joining Cheyat to get the latest version of Oracle DBA online training. Basic knowledge on SQL programming is sufficient for a learner to get started and become a master professional in Oracle DBA.